After a bit of a Christmas vacation, the Locust Moon Press Tuesday Tease is back to give everyone a glimpse at something we currently have in the works. Right now we’re closing in on the completion of our third Quarter Moon issue, due for release in February. The first issue of our quarterly comics & illustration magazine focused on wordless stories. The second was a grab-bag of fun & fighting & touches of melancholy. The third will celebrate a topic perfectly suited for Valentine’s Day. No, not love or romance or chocolate. Quarter Moon #3 is our erotica issue. And Alexandra Beguez has come back for another go, after having last created one of our favorite, and funniest, strips to date in Quarter Moon: Silence, “Alien Raver: Forbidden Fruit”. 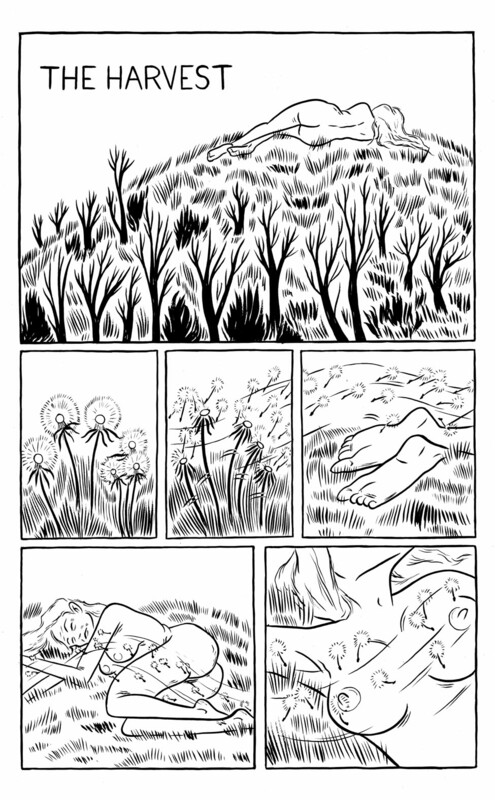 So today I thought we’d share the first page of her new story for #3, “The Harvest”. The setup seems simple enough, right? I promise you won’t be able to guess what happens next. This one’s out-there in the best way possible. There’ll also be a cover or two by a couple of awesome special guests. Stay tuned for those! This entry was posted in Making Comics, Tuesday Tease and tagged alexandra beguez, comics, locust moon press, quarter moon. Bookmark the permalink.